The proposed project involved the addition of High-Occupancy Toll (HOT) lanes to the Route 3 South corridor between Interstate 93 in Braintree and Exit 11 in Duxbury, Massachusetts. 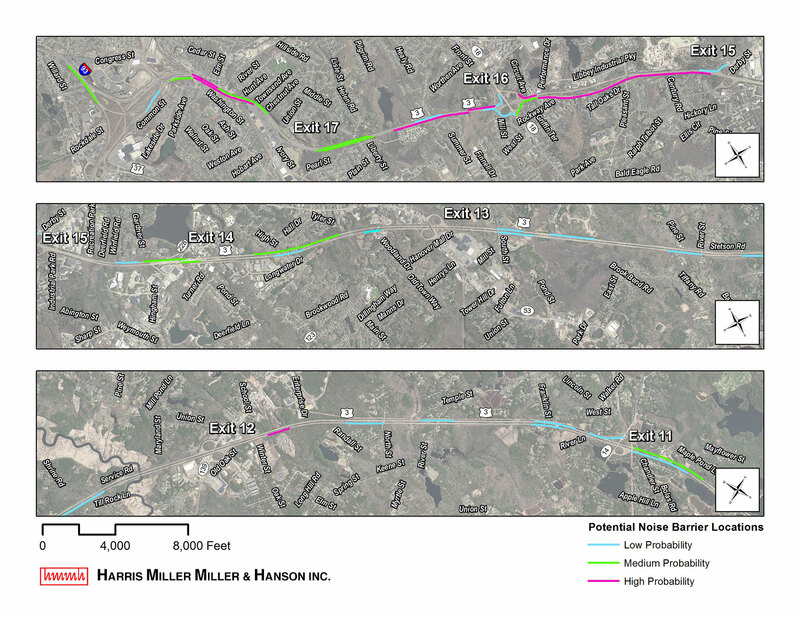 To minimize the time and cost for the study, HMMH used the results of the 2002 Route 3 Improvements Environmental Assessment/Supplemental Draft Environmental Impact Report and current aerial photography to evaluate the potential for noise impact along the corridor according to FHWA and Massachusetts Department of Transportation (MassDOT) Noise Abatement Criteria. The study corridor included many single- and multi-family residential as well as recreational noise-sensitive land use adjacent to Route 3. The potential cost of noise abatement was of particular interest to the project team, so HMMH employed an estimating methodology used in previous studies. HMMH estimated the length, height and benefits provided by barriers in each area where noise impact was expected, based on our extensive experience in modeling noise barriers in TNM. The approach computes an estimated Cost-Effectiveness Indexes (CEI) for each barrier. Based on how close to MassDOT’s allowable maximum each barrier’s CEI is, the barrier is assigned a probability of meeting the CEI limit if the barrier were modeled in detail in TNM. The computed cost of each barrier is then weighted by the barrier’s cost-effectiveness probability. The sum of the probability-weighted barrier costs is considered to be a reasonable estimate for barrier cost for the entire project. An explanation of methodology and tabulated results were included in the final ENF.